Deadline for abstracts submission 6 April 2012. Deadline for grant application 18 March 2012. No refunds for cancelled registrations/events after 1 August 2012. The official language of the Symposium is English. No simultaneous interpretation will be provided. All participants will receive a Certificate of Attendance. Participants who could receive a Certificate of Presentation should inform the Symposium Secretariat before Symposium, or at least one day before the session. The Certificate of Presentation will be given after presentation. 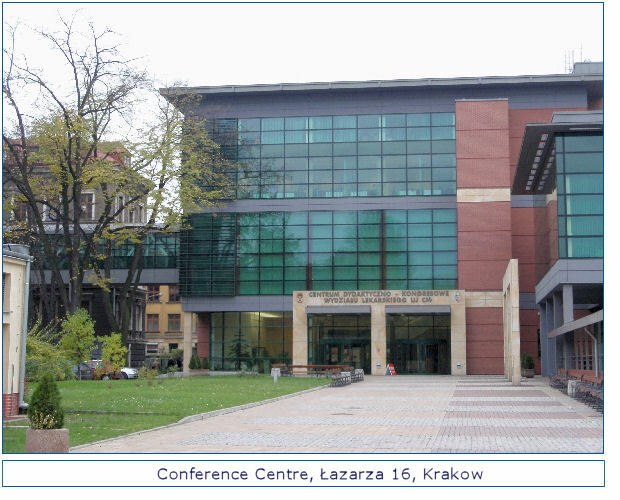 Symposium will take place in the Conference Centre, Faculty of Medicine, Medical College Jagiellonian University, Łazarza 16, Krakow. This modern building of 8000 m2 is adapted and equipped to serve congresses. The building has two large assembly halls, lecture-rooms, seminar computer room, library, computer reading-room and seminar rooms. The Centre is equipped with the air conditioner and also adapted for the disabled people. Wireless internet is accessible in the whole building.